Define Measuring the equilibrium cell potential? Figure shows how we can use a potentiometer to determine the equilibrium cell potential. Consider Figure (a). 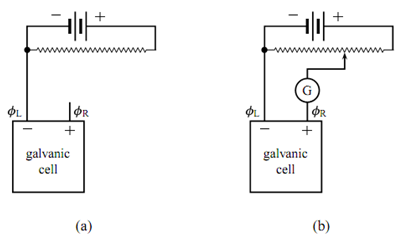 Outside the galvanic cell is an external circuit with a battery that allows an electric current to pass through a slide wire resistor. The cell's negative terminal is connected to the negative terminal of the battery. Since the cell is not part of this circuit, no current passes through the cell, and ΦR - ΦL is the zero-current cell potential Ecell, eq. The left end of the slide wire is at the same electric potential as the left terminal of the cell. In the setup shown in Figure (a), the electric potential within the slidewire is a linear function of the distance from the left end. At some position along the slide wire, the electric potential is equal to -R. We can determine this position by connecting the right terminal of the cell to a slidewire contact as shown in Fig. (b). When we place the contact at this particular position along the slidewire, there is no electric potential gradient in the connecting wire, and the galvanometer indicates a condition of zero current in the wire. It is a straightforward procedure to evaluate ΦR - ΦL from the zero-current position of the contact; this value is still equal to Ecell, eq. When we keep the slidewire contact in this position, no current passes through the cell; but if we displace the contact from this position in either direction along the slidewire, current will pass in one direction or the other through the cell. In practice, it is more convenient to measure the zero-current cell potential with a high- impedance digital voltmeter (a voltmeter that draws negligible current) instead of with a potentiometer circuit. what transformations take place in photosynthesis?how does glucose help in the formation of ATP from ADP? Benzene, wht is the strucutre of benzene? wht is the strucutre of benzene? EDTA, describe any three types of EDTA titrations. describe any three types of EDTA titrations. why is electron gain enthalpy of oxygen greater than sulphur?